Establishments in this industry are primarily engaged in manufacturing men's, boys', and women's robes and dressing gowns from purchased materials and fabrics. This classification includes the manufacturing of bathrobes, caftans, housecoats, dusters, lounging robes, and men's smoking jackets. Companies primarily engaged in manufacturing girls', children's, and infants' robes from purchased fabrics are classified in SIC 2369: Girls', Children's, and Infants' Outerwear, Not Elsewhere Classified. Knitting mills which manufacture robes and dressing gowns are classified in SIC 2253: Knit Outerwear Mills. In 2001 shipments of men's, junior boys', and little boys' robes totaled $9.3 million, while shipments of women's, misses', juniors', and girls' robes and dressing gowns totaled $112.6 million. Both sectors had seen significant sales declines in the late 1990s and early 2000s due to weak economic conditions in the United States, as well as increased imports from countries such as China, which joined the World Trade Organization in December 2001. As a result, robe and dressing gown imports from China jumped 12 percent in 2002. Sales for this industry had begun to decline in the late 1990s. 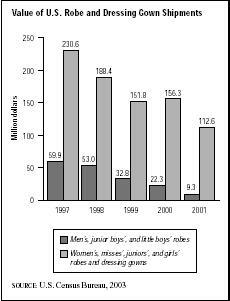 Shipments of men's, junior boys', and little boys' robes, which totaled $59.9 million in 1997, plummeted to $32.8 million in 1999. Shipments dropped by another $10.5 million in 2000, and they declined by more than half their value in 2001. Shipments of women's, misses', juniors', and girls' robes and dressing gowns plunged from $230.6 million in 1997 to $151.8 million in 1999. After rebounding slightly in 2000 to $156.3 million, they dropped to $112.6 million in 2001. While exact figures are not available, employment in this industry has been on the decline since the late 1970s. The top three industry leaders for this category were Lillian Vernon of Rye, New York, with sales of $238 million and 1,200 employees in 2003; New York City-based NAP Inc., with sales of $90 million for 2003; and New York City-based Host Apparel Inc., with 2001 sales of $100 million. Host Apparel was acquired by Sara Lee Corp. in 2001. Other significant companies in the industry included New York City-based Movie Star Inc., with 2003 sales of $64.9 million; Russell-Newman Inc. of Denton, Texas, which acquired the sleepwear division of bankrupt Kleinert's Inc. in 2003; and Leading Lady Companies Inc. of Beachwood, Ohio. In the late 1990s imported robes and loungewear competed for the domestic manufacturers' department store market share, and some department stores had begun to contract with foreign mills to issue their own insignia bathrobes. In one instance in early 1997, this cost the Neiman Marcus Group almost two million dollars in sales when 6,500 terry-cloth bathrobes were recalled at the request of the U.S. Consumer Products Safety Commission when the garments failed flammability tests, igniting upon exposure to flame. dedicated robe and dressing gown manufacturers in the United States. Famous athletic name-brand robes matching their shoes became available in large department store chains as well as specialty shops for lingerie, sporting goods, and mail-order catalogs. Sports and leisure apparel outside of this primary category enjoyed a significant increase in sales throughout the 1990s due to their diversification. Robe manufacturers experienced increased business from hotel chain orders, particularly where terry-cloth towels are also provided. American companies manufacturing robes and dressing gowns have long been in competition with overseas manufacturing, mostly from China and Taiwan. More than half of the robes and gowns sold in America are imported. American exports of these products have traditionally been small. Although American exports were expected to be one of the main factors in increased production in this industry by the end of the twentieth century, this prediction failed to materialize in the early 2000s. In fact, to curb growing imports from China, the United States Commerce Department established new quotas on robes and dressing gowns from China as of 2004. Technological advances have helped manufacturers of robes and dressing gowns improve efficiency in production and distribution of their goods. Three areas in particular have been improved in this industry with technological developments: computer-aided design, production, and communications; modular manufacturing systems; and ergonomics (workplace equipment designed with respect to worker health and safety). "U.S. to Curb Textile Imports from China." Asian Economic News, 24 November 2003.